Bruno's 24K Magic World Tour Merchandise - Available online exclusively here at the Official Bruno Mars Webstore. The Bruno Mars 'Shades' t-shirt features Bruno Mars wearing a red button down shirt and signature shades. The design is printed on a white Canvas brand slim fit t-shirt. Bruno's 24K Magic World Tour Merchandise - Available online exclusively here at the Official Bruno Mars Webstore. The 'BRUNO Block' t-shirt features the BRUNO MARS block logo in gold. The design is printed on a black Next Level brand t-shirt. Bruno's 24K Magic World Tour Merchandise - Available online exclusively here at the Official Bruno Mars Webstore. 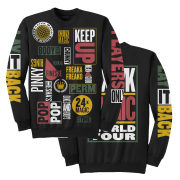 The Bruno Mars '24K Magic' Crewneck features the album cover printed on a white unisex Bella+Canvas brand crewneck sweatshirt. 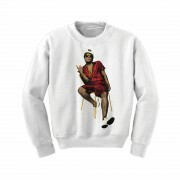 The Bruno Mars ‘Pop Pop It’s Christmas’ Sweater here features a photo of Bruno Mars in a holiday design. The design is printed on a navy crewneck.